These two figures (which will be difficult for beginners) have the same beginning moves. The first six instructions in each are the same. In the Story of Mr Spider the sixth picture, (a triangle) represents spiderwebs under the eaves of a house. In the Fighting Dinosaurs the same intermediate figure represents a Volcano. Tell the story while making this traditional figure from the Gilbert Islands. Follow the numbered instructions. Names in bold are figures to display. So he wove a web high up under the eaves of the roof. He had no luck catching flies so he swung down, scurried under a bed and wove another web. Again he had no luck. So what did he do? He made a bag climbed in and went to sleep! When he woke up it was a beautiful day so he went outside and wove a web in the sun. (Mr Spider) As he swung in the breeze, listening to the buzzing flies he thought, “I’m bound to catch something!” Suddenly a dragonfly was struggling in the web. But it was too big and strong and it broke free, leaving two little spiders on a strand of web. They scurried about saying, ‘Come and join us!”. Mr Spider hadn’t caught any flies, but he had made some friends! Tell the story while making this figure. “FFF!” “FFF!” They were blowing fire at each other. “FFF!” I thought one was going to blow the other away. “FFF!” Then it did! (one disappears) Then the other dinosaur flew after it (the other follows) and I never saw them again! 3. 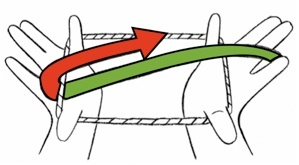 Each thumb over own far thumb string and near index string takes near little finger string and returns. 4. Each middle finger over index loop takes far thumb string and returns. 18. 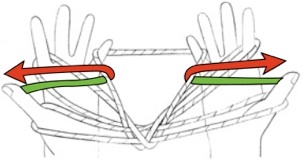 Release thumb and upper index loop to show the DRAGONFLY. 17. This is ‘Mr Spider’. Move forward and back to show web swinging. 15. 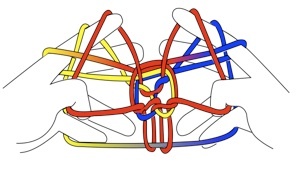 Index fingers enter both thumb loops from above. 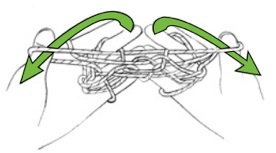 Middle fingers squeeze against index to maintain the position of the new index loops (lower thumb loop becomes upper index loop) as index remove loops. 16. 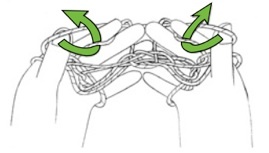 Thumbs widen upper index loop by entering upper loop from above and pulling upper near index down while upper far index is held in pace by continuing to squeeze middle and index fingers together. 13. Hold this 3D figure up to display a ‘BAG’. 14. 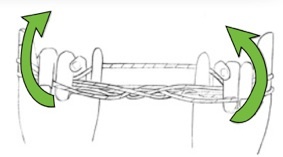 Thumbs go over index loops to take near little finger strings from below. 9. Each little finger removes upper index loop from below. 8. Each index takes near little finger string from below in middle of figure. 7. 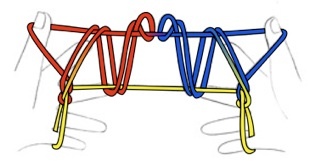 Each little finger goes over the index loop to take the far left thumb string from below. 11. 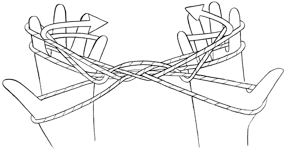 Swap index loops: first place index fingers tip to tip, then slip right index loop onto left index tip. 12. Right index takes lower left index loop over the upper. 5. 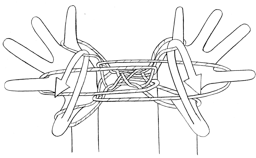 Thumbs remove middle finger loops from below and return. 5. 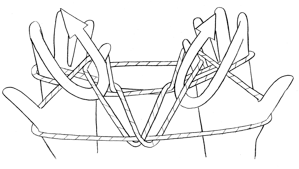 Thumbs over index loops remove middle finger loops from below and return. 3. 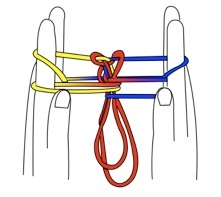 Each thumb over own far thumb string and index loop takes near little finger string and returns. 4. Each middle finger over index loop takes far thumb string and returns. Release thumbs. 11. Hold thumbs high to display ‘CAVE’. 8. 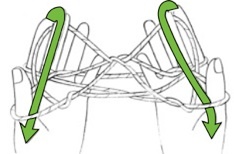 Lower thumb string is squeezed with the index above and the middle finger below. 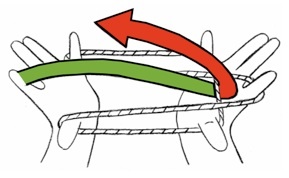 This loop is then lifted over the upper thumb loop and off the thumb. 9. The loop just lifted by the index and the middle finger is then pushed back through the remaining thumb loop. 10. 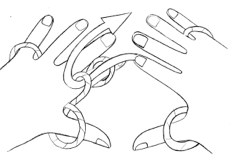 The thumb drops its loop to take the loop held by the index and middle (which is released). 13. Lower thumb is squeezed with the index above and the middle finger below. 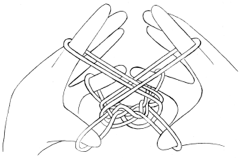 This loop is then lifted over the upper thumb loop and off the thumb. 15. 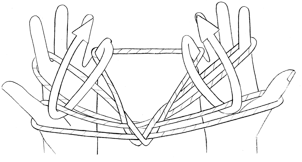 The thumb drops its loop to take the loop held by the index and middle (which is released). 16. Hold thumbs high. Release index. Then pull hands apart (quite vigorously). 18. Twist hands to make dinosaurs fight. One advances while the other retreats. 19. Twist hands the other way to make dinosaurs fight. Again one advances while the other retreats. Release right thumb and right dinosaur disappears. 20. 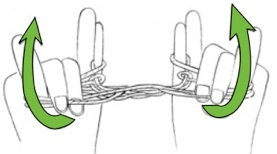 Rotate right little finger to untwist right hand string. 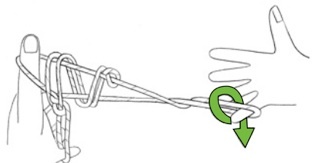 Lift near right little finger string with right thumb to maintain shape of left dinosaur. Release left thumb to make left dinosaur disappear. Look to the right to suggest it has flown away. 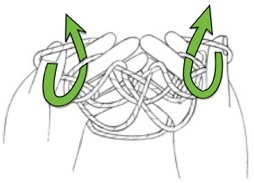 Instructions 8, 9 & 10 and instructions 13, 14 & 15 involve ‘double navahoing’ the thumb loop. The following achieves the same result. 3. Completed. Now do the same with the other hand. 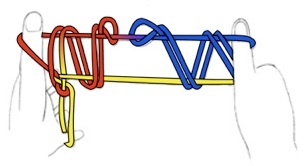 In the FIGHTING DINOSAURS the lower loop (blue) is taken over the upper (red), off the thumb completely and then pushed back through the thumb loop. The thumb drops its loop and then takes this loop. It achieves the same result and works better with this particular story.